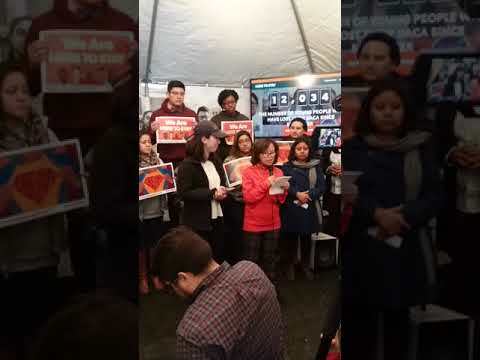 Washington D.C. – On December 13, 2017, Hee Kim, a community leader with Korean Resource Center (KRC), spoke at a press conference organized by United We Dream about her experiences as a parent of a DACAmented child and the need to pass a clean DREAM Act before the end of the year. Impacted Asian American & Pacific Islander (AAPI) youth and allies also met with Senator Richard Durbin (IL), who first introduced the DREAM Act, and staff with Senators Chuck Schumer (NY) and Dianne Feinstein (CA). The central ask during these visits was to urge members of Congress to attach a clean DREAM Act – one that does not make changes to the current family immigration system or to the diversity visas program – to the next continuing resolution or government spending bill and swift passage before the holidays. NAKASEC and affiliates will conduct activities in Washington DC until a clean DREAM Act is passed. Next week on December 19, NAKASEC, HANA Center, and the Korean Resource Center will organize a day of action for educators and students to underscore the urgency of passing the clean DREAM Act. More information can be found on the Facebook event page.